Have you been wondering about starting a bee hive? Mike and Sandy Halby from the Pikes Peak Bee Association are the folks to ask. They have been holding classes on bees for many years and can answer any question you have. Their email is MandShalby@comcast.net. You can also contact them at 719-528-5483. IF YOU NEED SWARM and BEE removal please call Lazarus Fields at 765-425-1940. Do not attempt to remove the bees yourself. This should only be attempted by experienced beekeeper/bee removal people . EPCCD WILL BE AT THE HIGH PRAIRIE LIBRARY TO HOST OUR ANNUAL SOIL HEALTH AND EDIBLE LANDSCAPE WORKSHOP ON MAY 4TH, 2019. CLASS BEGINS AT 10:00 AM AND WILL END AT NOON. SOIL SCIENTIST JEFF GOATS WILL EXPLAIN HOW TO GET, MAINTAIN AND THE BENEFITS OF HEALTHY SOIL. ANDY HOUGH WILL SPEAK ON EDIBLE LANDSCAPING AND WILL HAVE FRUIT BEARING TREES AND SHRUBS AVAILABLE FOR SALE. REFRESHMENTS WILL BE SERVED AND THE CLASS IS FREE. RAIN BARREL EVENT AT THE BIG R ON POWERS AND CONSTITUTION FROM 9AM TO 3PM. RAIN BARRELS WILL BE AVAILABLE FOR PURCHASE. STOP BY AND MEET THE EPCCD FOLKS AND LEARN ABOUT WATER HARVESTING. 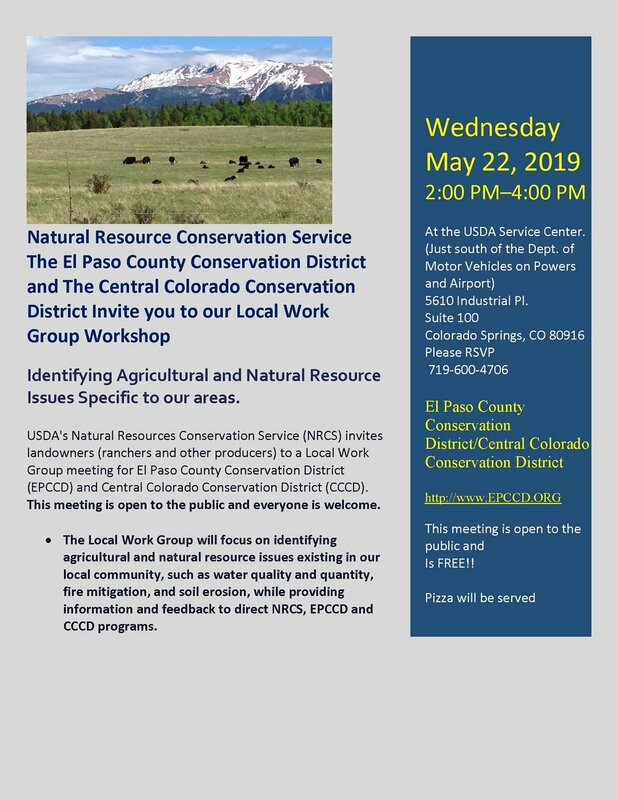 MAY 22, 2019 LANDOWNERS FROM EL PASO COUNTY, NRCS, THE EL PASO COUNTY CONSERVATION DISTRICT, AND CENTRAL CONSERVATION DISTRICT WILL MEET TO DISCUSS THE THREE KEY ISSUES LANDOWNERS ARE HAVING. LAST YEAR THE FOCUS WAS ON SOIL EROSION, RANGELAND MANAGEMENT, WEED CONTROL, AND WATER QUANTITY. PLEASE JOIN US FOR A LIVELY DISCUSSION, GREAT INFORMATION AND PIZZA!